Today, I am not featuring what's inside my Big Boy's lunch box. He just had fried chicken today and I let the helper cook as I lack sleep. 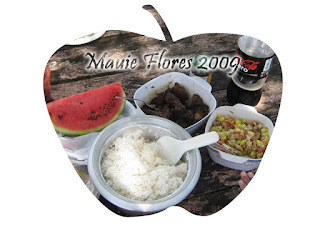 I am still having that Sierra Madre thrill so I am sharing the food that we brought for our picnic last Saturday. I cooked Chicken Adobo and prepared Green Mango Salad. Cooking Chicken Adobo is a long process for me as I abide by my mom's tried and tested method. I marinated the chicken in soy sauce, vinegar, garlic, and whole peppercorns for about 3 hours inside the refrigerator. Then I let the marinade boil before I turn the knob to low flame. That would be another 1 hour of slow cooking or until the sauce is almost all dried up. When I bring Adobo to a picnic, I like it dry and crispy. So I added canola oil and pan fried the chicken pieces until it was crispy. My departed maternal grandmother also cooked adobo this way. But she loved Pork Adobo so there was no need to add oil anymore. For the Green Mango Salad, I just mixed up chopped pieces green mango, tomatoes, roasted eggplants, white onions, and salted eggs. I brought a bottled bagoong (salted shrimp fry paste) but I didn't mix it in because I wasn't sure if my brother-in-law was allergic to it or not. We had sliced watermelons and some turnips for dessert. 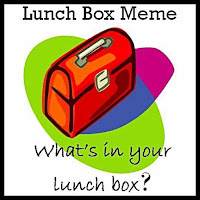 What's in your lunchbox today? Write about it by joining this meme. P.S. I was experimenting with photoshop and I cropped the picture with an apple-shaped cookie cutter. Coolness!